A somewhat entertaining movie about a bad cop who finds himself being rightly targeted by internal affairs for his abusive use of force. Rampart is not very good. It’s an okay movie that is overloaded with characters and situations. This movie is so loaded up that it has its main character, Dave Brown, (Woody Harrelson,) living with four different women (two ex-wives and two daughters,) while he is still dating another woman on the side. There are two different investigators going after him, (Steve Buscemi and Ice Cube,) both for different cases. The cast here is star-studded and normally that would be a good thing, only in this movie, the great actors aren’t given the opportunity to shine. There is too much going on. So someone like Ben Foster, for example, who plays a homeless man, is completely wasted. The stories that involve Brown on the force and what he does and has done, are pretty interesting. The ones about his homelife are not. And the movie also takes a little too long to get going, holding off on showing us any major violence or abusive acts on the part of Brown, for just long than it should have. Harrelson is pretty good here, and some of the sitations, like that of Ned Beatty and the card game, are definitely entertaining, but there’s just too much going on here, and not enough attention given to each storyline. 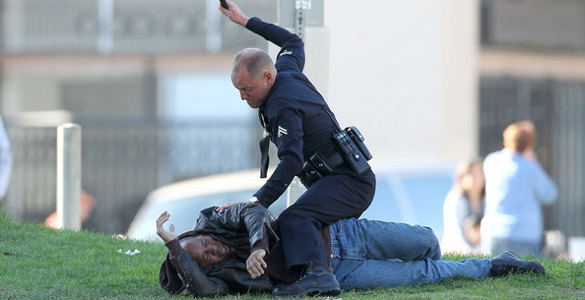 Rampart is a movie about an LAPD cop who is physically abusive and dirty. There have been plenty of movies about this topic, from Narc to Dark Blue, and for some reason it’s always the LAPD, as if no other cops can be dirty. Back in the seventies, it was New York cops with movies like Serpico, but there hasn’t been a good movie about corrupt New York cops since Night Falls On Manhattan and City Hall, (both made in the nineties.) In the past two decades, it’s been all about the LAPD. Call it the Rodney King effect. Rampart doesn’t quite measure up to any of those other films, simply because it is too much about this one character and his life outside of the force. Compare that to City Hall or Night Falls on Manhattan or Narc, three films that are all about one single incident. Rampart has a little too much going on. Consider that this character Dave Brown (Woody Harrelson,) has two ex-wives, two daughter, and also a woman he is seeing now, and that we get to spend time with all of them. And none of that has to do with him as a policeman. If it’s a character study the movie is after, then this one does a fine job of that. In fact, in many ways it is like the movie Steve Jobs, trying to mix the work life with the home life, whenever possible, and letting the home life story get in the way of the work life story a little too much. The difference is that in Steve Jobs, the Michael Fasbender-Danny Boyle-Aaron Sorkin film, every scene took place at a product launch, helping the movie stay grounded and on track to be about the products whenever possible. With Rampart, the movie has free will to go wherever it wants, and that turns out to not be such a good thing. Steve Jobs used the product launches of reminders to reign it back in, if the family storyline ever went to far off course. With Rampart, there is no such luck. To be fair, there are a couple of incidents that are explored in strong detail. Two to be exact. And the first one doesn’t come until about thirty minutes into the movie. That’a a problem. The movie waits too long to give us something to hold onto. Instead of giving us an incident and something to really grab our attention, the movie opens with Brown taking out a rookie cop for the day and showing her the ropes. He explains to her the way if he is ever called to the carpet for something he did, he just makes up trial cases and years, and nobody ever calls him on it. He shows her that they can ride up on Mexican men, flash their lights and sirens, and watch and laugh as the men all go scattering in different directions, running as fast as they can. When arriving back at the station, Dave beats a suspect up inside an interrogation room. We are looking for a scene of major violence or surprise to get our attention, and if this beat up scene is supposed to be it, then it doesn’t quite work. Maybe that’s because the movie telegraphs it, a mile ahead of time, having Brown ask for the room and for the door to be shut behind him. You know what’s about to happen long before it actually does. Brown goes home to his family after the day at work. He lives with those two ex-wives, Anne Heche and Cynthia Nixon. He has a child with each of them. Two girls. The oldest is played by Oscar winner Brie Larson, long before she was old enough to give her amazing performance in Room. Here, at home, one thing that definitely works is an early conversation where the younger daughter asks her father questions about inbreeding, wondering if their family is anything like that. He explains to her that he was never married to both of their mothers at the same time, and that he married one, had a child, got divorced, then married the other and did those exact same things. What works about this scene is that their home situaiton is kind of complicated, and it all gets explained to us, the audience, right here in this moment. On top of that, it gets explained in very simple terms (well, except for the use of the words consecutively and concurrently,) because Brown is talking to a little girl. After this, we get our first big incident scene. It is Brown getting hit by a car while on the road. Another car slams into him, from out of nowhere, and when Brown approaches the driver, the man hits him with the car door and runs away. That prompts Brown to run after this man, chase him down, tackle him, and then beat him on the ground. The incident is caught on tape, and now, for the first time, the movie is getting kind of interesting. Brown is called into the office of the big boss, Sigourney Weaver. This is the kind of role that Weaver has been playing a lot in the past decade, from Chappie to Baby Mama. She is always the big boss. I suppose that can be traced all the way back to Working Girl, in the eighties. Maybe Weaver just has this kind of authoritative presence about her, or maybe she likes taking these roles. Either way, here she tries to get Brown to retire and he outlines his case against that idea, and exactly what he would do against the department if they ever tried to force him out. We see this taken before a sort of hearing with Steve Buscemi representing Internal Affairs or whoever is prosecuting Brown. At one point, Brown does that thing where he makes up a case and says a year, and Buscemi attempts to call him on it. No luck. Brown has a response planned, even for this. He once spent some time in law school, and so he knows what a real case would sound like and how to present it. This movie has a star-studded cast, so much so that actors like Buscemi are given little more than cameos. Another actor who has come to play is Ned Beatty, the veteran star of Deliverance. Beatty is one of those shady characters, who you are not sure of exactly what he does or even where his loyalties lie. Brown trusts him just a little more than he should. The Beatty character, Hartshorn, is a former police detective who is now retired, and finds illegal jobs for corrupt cops to pull off. He tips Brown onto a card game where there will be a lot of cash. Ice Cube plays a lawyer who arrives on the scene and starts targeting Brown. Cube is only interested in this latest case, about the card game robber shooting, and he makes that pretty clear. Then there are some other characters too. Robin Wright plays a lawyer who starts sleeping with Brown. Her story is never made completely clear, and like Hartshorn, she is a bit of a mystery. Why is she there, at the bar, seemingly singling out Brown? Is she investigating him too? And then there’s a homeless man, played by Ben Foster, who may or may not have witnessed the card game robber shooting. What all of this comes down too is just too much going on. Too many characters and too many plot threads. Somewhere in the second half, Brown starts having to deal with his wives and daughters too. His wives want him to move out so they can get on with their lives. His older daughter comes to visit him at work, hoping to find out if everything they say about her father is actually true. Then the two girls come together, to the hotel room where Brown is staying, to drop clothing off. It’s just too much. What ends up happening is that fine actors like Ben Foster never get the opportunity to shine. The ex-wife subplot is somewhat interesting, but either not given enough time, or given too much time. Too much, because it cuts in to the story of Brown and his corrupt police work. Not enough because it might have been more interesting if we got to see more of the Cynthia Nixon character (the good cop to Anne Heche’s bad cop,) and got to understand her side of everything a little bit more. Rampart is an interesting and entertaining movie, but it is also quite flawed. The movie would have benefitted from an opening that grabbed our attention, or at least an incident happening somewhere among the opening scenes. Instead, we have to wait for a while. And then the biggest problem is too many characters and too many plotlines. Now, each of the individual storylines is good (although I suppose I could have done without everything from his daughters,) but the balance of time just doesn’t work out smoothly. Too often the home life story gets in the way of the work life story. With the all star cast we have here, its a real shame that the movie is so over-crowded that actors like Ben Foster and others are given almost nothing to do, and are completely wasted.